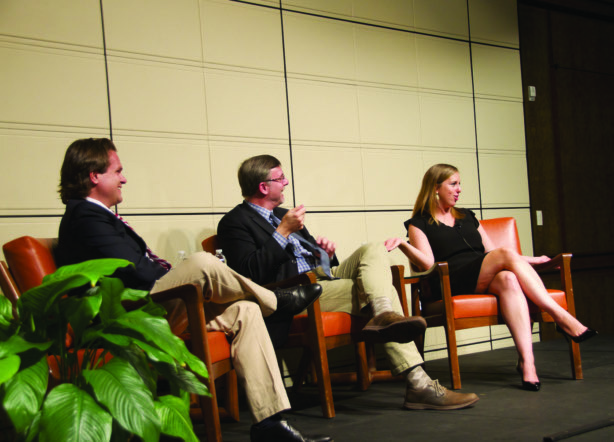 Brandi Hofﬁne ’06 and Michael Shear ’90 spoke Oct. 10 at the Athenaeum. Hofﬁne worked as a spokesperson for the U.S. Treasury, as communications director for Tim Kaine’s 2012 U.S. Senate campaign, and for the Democratic Party and Democratic National Committee before becoming the assistant press secretary and spokesperson for the White House in 2014, where she handles a range of domestic and international policy issues. Michael Shear is currently a White House correspondent for The New York Times’ Washington bureau. He was a reporter for The Washington Post and has covered several previous elections. He was also a member of the Pulitzer Prize winning team that documented the shootings at the Virginia Tech campus in 2007. The discussion was moderated by Zach Courser ’99, who is a visiting assistant professor of government and research director for the Dreier Roundtable. The following is an excerpt from that discussion. Zach: When you look at the tools that you have to communicate with the public, you think about, for example, WhiteHouse. gov or Twitter or Facebook — has this really changed the way in which presidents communicate with the public? Brandi: I think one of the more telling statistics I’ve heard is, when the president was re-elected in 2012, there were fewer than a billion smartphones in the world, and now 1 billion people use a smartphone to check Facebook every day just four years later. The central question [is], “How can we communicate the president’s proactive policy agenda and how can we actually get that message into people’s homes in whatever way they’re receiving their news?” I think the sort of overall changing landscape of media means less control. But it does mean that there are ways to get the president’s voice particularly out there, tools that we can use that we didn’t have before — Facebook, Twitter, Snapchat — you know, the White House has a Snapchat channel. [P]residents have always used whatever bully pulpit … to get their message out, and that dates back to the earliest days of our union. The president often quotes Lincoln, who said, “With public sentiment, nothing can fail. Without it, nothing can succeed.” [E] ven from the earliest days of our union, presidents understood that being able to effectively communicate your agenda to the public was essential. Zach: Mike, have you seen a change in the way in which you’re able to access or understand what’s going on in the White House because of these digital tools? Michael: The thing that concerns me, and the thing that I think this president and people like Brandi have been really good at doing, is ﬁnding ways to get around the critical ﬁlter of reporters who cover him every day and who are substantively knowledgeable about the stuff that is the bulk of the president’s agenda. I’ll give you one example that Brandi hates but I’m going to give it anyway. Brandi: Here we go again. Michael: I know, here we go. We went to Africa with the president in 2013. One of the places we stopped was Senegal, and the president and the ﬁrst family took some time out to go to what they call the … Door of No Return. It’s sort of a dungeon where Africans were taken, held, and then ultimately put on boats to be sailed off to America to be sold as slaves. It’s now been turned into a kind of museum. As we went to enter the dungeon to follow him along, the press folks blocked us and said, “No, no, no, there’s no press today, there’s no press for this event. The president and the ﬁrst family want to have a private family moment.” [The] ﬁrst family [was] down there for about an hour, maybe a little bit less, and then he emerged and we went on with the rest of our trip. The really frustrating point came the next morning when the White House published a seven-minute video of the president and the ﬁrst family in the dungeon that was taken by the White House videographer. And to me, it’s a good example — it’s not the most weighty example, right, like I mean the fate of the world isn’t going to rise or fall on whether or not the press has access to a family thing — but to me, what it represented was a question of control and access, and what the president really wanted was not a private family moment. What the president really wanted was control over how that moment was presented to the American public, and with Facebook, they had it, right? That essential conﬂict between the press and the White House over access and control plays itself out again and again and again. Zach: How much does the president rely particularly on his communications staff to control the message? Brandi: I sit in a room that’s … half the size of this stage … with eight people that backs right up to where the reporters work, and Mike can come any time of day and stand over my shoulder and ask me any questions he would like. Brandi: And he does. And I love it, because Mike is actually wonderful and lovely to talk to and usually has smart questions that make me think and make me have to run to our policy experts and ask a bunch of questions before I get back to him. But, you know, that sort of level of access and relationship is what the president pays people like me for, but that is not in place of his own engagement with Mike or Mike’s colleagues or a bunch of other people across the spectrum. Zach: What does your job look like on a daily basis, and Mike, what does your job look like on a daily basis? Brandi: I break my job up into three buckets, and I think there’s two buckets that heavily overlap with Mike and then a third that eventually overlaps with Mike. The ﬁrst is prepping the press secretary for the press brieﬁng every day, which is a process that starts the night before and goes all the way until the brieﬁng is over, around 2 p.m. It requires drawing on what Mike asked me the day before to think about where he’s going to go tomorrow with his story and, you know, what question he might pose to the press secretary to make sure he’s not caught off-guard. A second bucket is just all the other questions that Mike [and his colleagues] have on a given day. And then the third is thinking ahead to what policy we’re going to roll out the next week, what announcement are we going to make. How are we going to do it? Michael: My day is usually divided between short-term, longer-term, and strategic stories, right? And so the short-term stuff is literally, you come in and you have no idea — that you think you’re going to be working on one thing, and then David Petraeus resigns at 4 p.m. on a Friday or whatever. The great, wonderful thing about journalism is you jump in at that moment. Particular to The New York Times, we have four White House reporters and we have a kind of duty rotation that’s on a weekly basis, so on any given week, if it’s my duty week, then Brandi sees me more often. And then the third bucket is the strategic stuff, and it can be short-term or it could be long-term, but it tends to be stuff where we’re trying to pierce the veil of their kind of deﬁned message. Student: What do you think about organizations like NowThis or AJ+ or even things like The Daily Show, John Oliver, and also, what do you think about the internet and virality giving rise to sort of niche news organizations that are on the extremes of the political spectrum? Brandi: [T]his president is the ﬁrst sitting president to appear on a late-night television show. So I think it’s incredibly powerful that we have a president who can give long, sweeping speeches on foreign policy, but he can go on Jimmy Fallon, slow-jam the news, and maybe he’ll sneak in a mention about his trade deal while he’s there. So I think that’s a tool that’s been effective for us to use to communicate his policy agenda. Michael: I think that those other kinds of outlets are great. But I do think that there’s two dangers. One is that if all you rely on is the kind of humor sites and the kind of late-night shows, et cetera, there’s a danger of getting a kind of warped perspective on what’s going on in the world, both in terms of what they choose to talk about and how they choose to talk about it. And I think what the internet has done is given rise to the ability, never before seen, to be able to feed your consumption of news only with stuff that you already agree with, if you want to. The ability to … ﬁlter out anything you disagree with by picking and choosing the narrow stuff that you already believe, is really a kind of dangerous thing for our kind of body politic. There are moments when I’ll see something on the [Bill] O’Reilly show and then I’ll look at what Rachel Maddow did on MSNBC about the same event, and she does it in her perspective, and I’m thinking, “I was there and neither of those have any basis in reality.” I worry about what happens to our country if we lose sight of what actually happened and are only thinking about a kind of version of what happened that conforms to what we already believe anyway.